Summer is here, and it’s finally not 98 degrees in the shade (in New York… I deal with the winters so I don’t have to survive 101 degree days…) so I can get out and enjoy the fireflies. One of my favorite placed to do that is in my hammock sipping something cold. 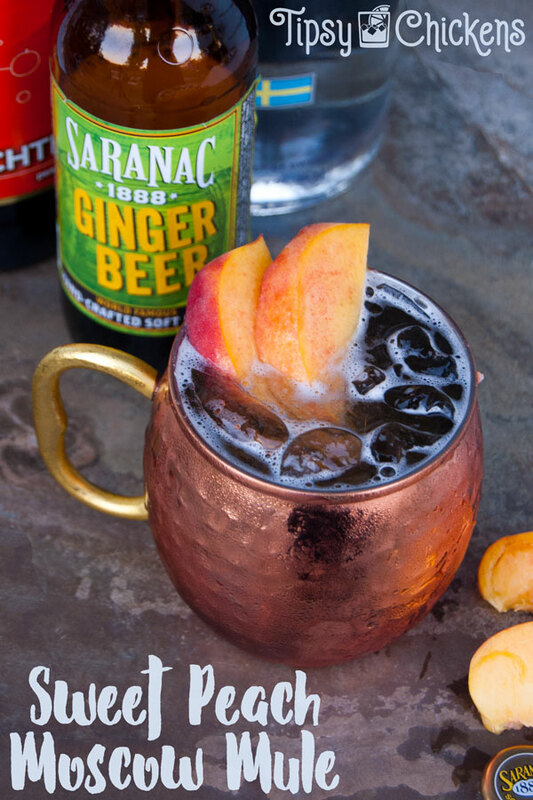 Like this Peach Moscow Mule. Peaches are starting to show in the farmers markets, sadly it’s hard to grow peach in my immediate area but several places around here get really good ones. Rarely can I pass up a chance to buy a few (or more) when I see them available. Ripe, almost mushy peaches dripping with juice are my tied for my favorite summer treat with watermelon. 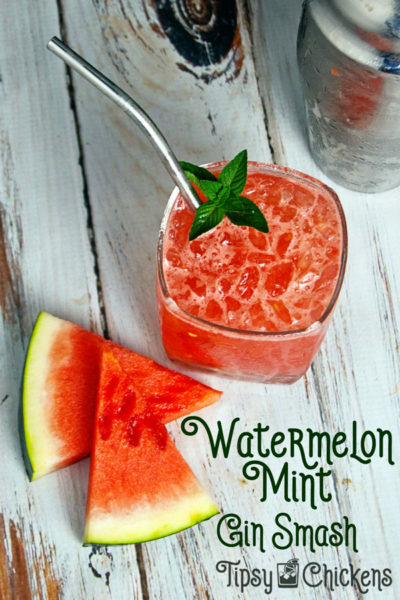 If watermelon is more your thing check out the Watermelon Mint Gin Smash I shared earlier. 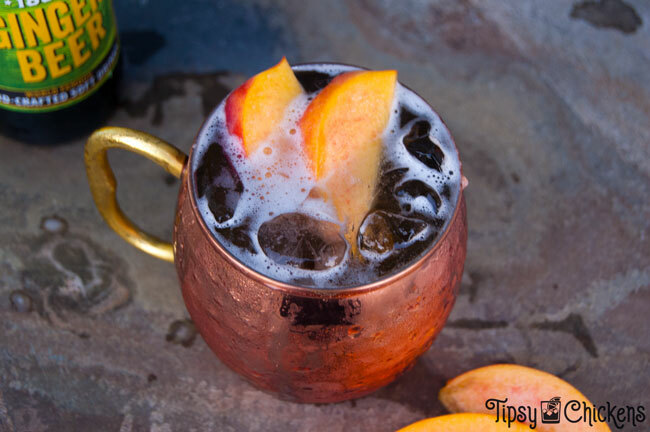 This Peach Moscow Mule is obviously based on the original Moscow Mule. It’s simple recipe and easy to find ingredieants are perfect on their own and also itching for flavorful adaptations. The original Moscow mule is vodka ginger beer and lime. I dialed back a titch on my vodka and added some schnapps. I used peach schnapps for an extra kick of peach flavor and booze. I skipped the lime, opting to get my acid from the peaches themselves. Speaking of I am a yellow peach lover, white peaches are great but I really love the slight acid bite from the yellow. 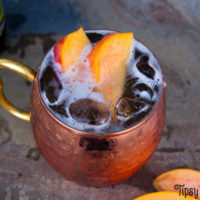 Great cocktails are about balance and we can use that acidic bite in the yellow peaches to our advantage here. 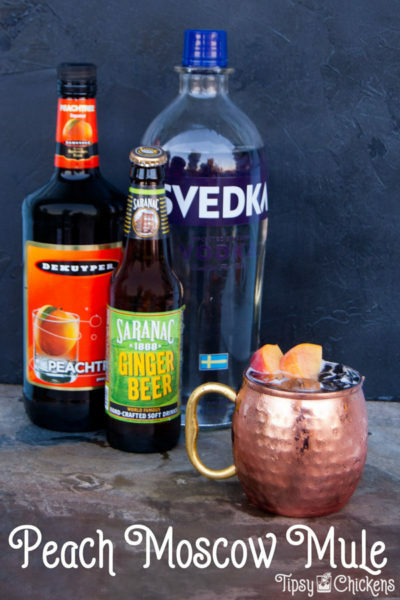 Traditionally Moscow Mules are serves in copper mugs but it’s not a necessity. If you’re a copper fanatic like me you might want some anyway and you can pick them up just about anywhere from Target to TJ Maxx to Amazon. I bought a single for my picture taking shenanigans but I’m putting this set of Copper Mugs and Copper Straws on my Christmas list. Fun fact, I don’t peel things unless absolutely necessary. For this I sliced my peaches and tossed about 1/4 of a peach in the bottom of a cup and mashed it up with the bottom of a spoon. Then I made a mental note to pick up a muddler. 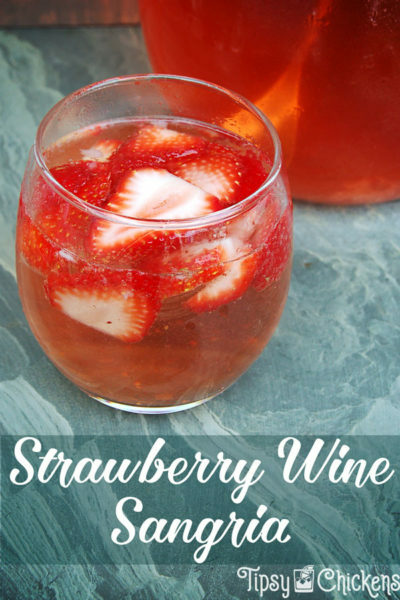 Pour in the vodka and peach schnapps and give it a quick stir. Add ice and top with ginger beer. If you can get your hands on Saranac Ginger Beer do yourself a favor and buy it. Take out a second mortgage if you have to. Saranac is a small brewery local to where I live. I actually drive it past it on my way to work every day. I’m not a big soda fan but I can never pass up a Saranac Root Beer or Ginger Beer. If you’re reading this in the winter and you can’t find any good peaches you can totally skip the muddling and just do the vodka, schnapps and ginger beer. It’s not quite as fancy but it’s still down right delightful. Don’t forget to PIN this to your Cocktails or Summer board! Fill mug loosely with ice and top with ginger beer. One bottle should make three servings.